We kick off blogging about Project Submissions to Across the Table, Across the Land with a project led by Macy Dorf, who lives in Denver, Colorado. Macy Dorf, Denver Colorado: Working with Diana and Davine on making a plate with his mold. Macy has had a studio/gallery for over thirty years in the same neighborhood. The building houses a number of groups, and is part of an urban renewal project. Macy Dorf, Denver Colorado: Macy teaching Miles how to use the slab roller. 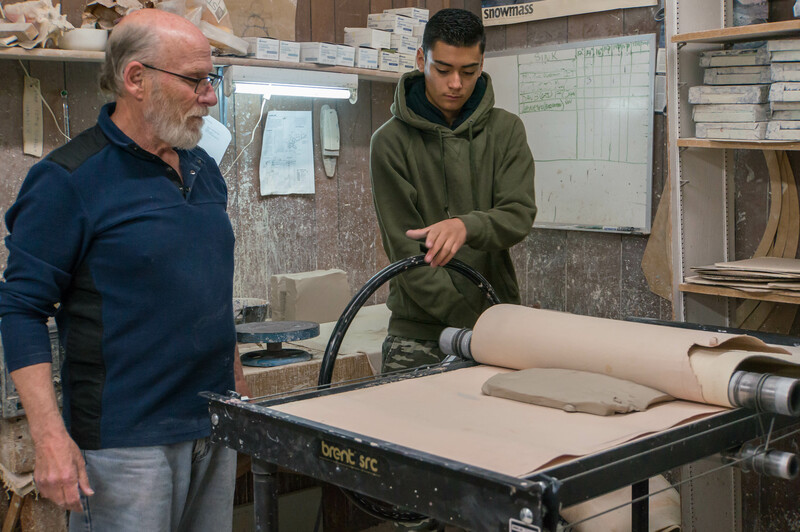 Macy’s project submission via the Across the Table webapp ) shared how he connects three disparate groups through ceramics: at risk high school students who work with Art Street, youth employment culinary students, and Denver Housing Authority senior citizens. Macy Dorf, Denver Colorado: Diana lifting her rolled slab. 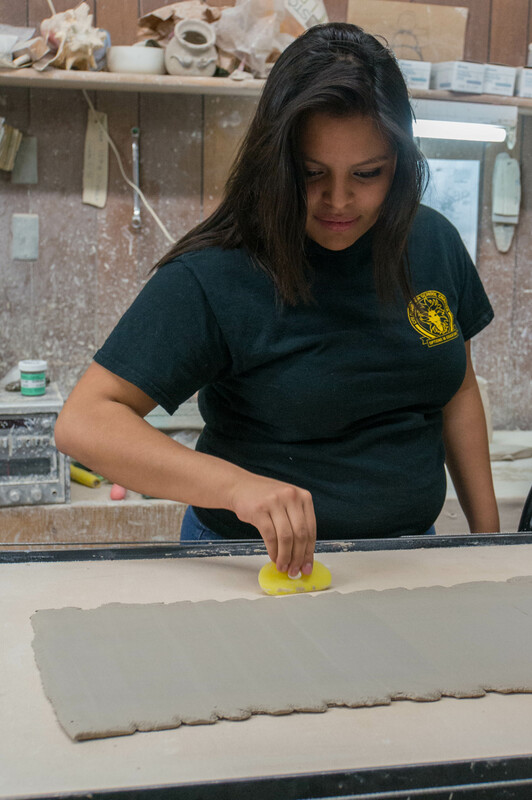 Macy Dorf, Denver, Colorado: Teaching students new to clay how to trim. Macy’s studio is the classroom in this project. 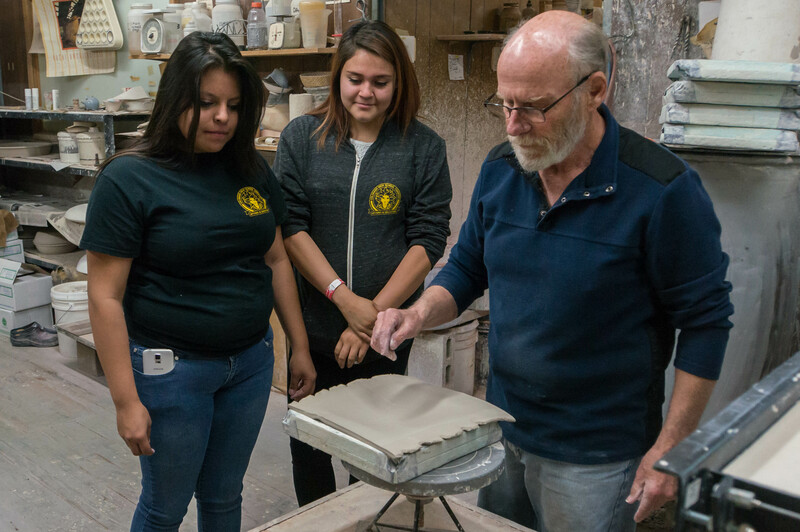 High school students visit Macy’s studio to make square plates using his molds. These are taken to Art Street, where they are decorated with under glaze. Macy then glazes the work in his kiln. Macy Dorf, Denver, Colorado: RJ’s plate. Macy Dorf, Denver, Colorado: RJ and Gabe working in Macy’s studio. Macy Dorf, Denver, Colorado: RJ focused on decorating her plate. (Denver, Colorado) Submitted to Across the Table, Across the Land by Macy Dorf. Macy Dorf, Denver, Colorado: Jennifer’s plate. Macy Dorf, Denver, Colorado: Gabe’s plate. Youth Employment Academy will create and decorate cookies and cupcakes, which will be served on the plates to senior residents in Denver Housing Authority during their monthly coffee group. All participants– high school, culinary and senior residents will be at the event. 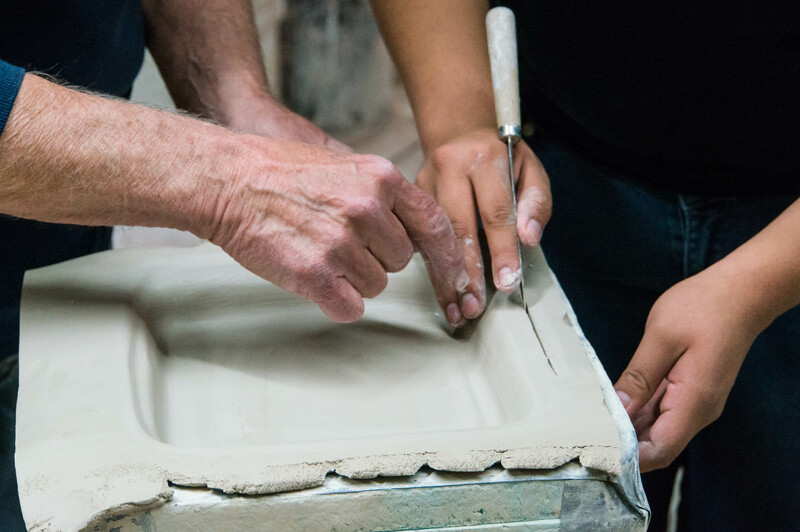 Through Macy’s studio, three otherwise unconnected groups come together through clay.All participants will interact with the senior residents during their monthly coffee group meeting at the Denver Housing Authority. All will be there to enjoy freshly made treats on handmade plates – watch for the updates following their event in November! Thank you, Macy- and Davine, Diana, Gabe, Jennifer, Miles, RJ, and Tishawna, for sharing your project. Once we received the information via the webapp, it was easy for us to reach out to Macy to learn more about his project, discuss photos (with permission slips signed by participants/parents of minors), and voila! Project submitted – and now part of the national archive we are building together to document how clay works in communities right now. Have a project that connect food, clay and community? You can submit your projects on the webapp to participate in Across the Table, Across the Land. Selections from the submissions will be on view at NCECA’s 50th Anniversary Conference in Kansas City.